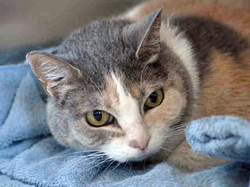 After 12 years of ownership, Beneditte was surrendered to the San Jose shelter due to her guardian moving. Ironically, this cat had been adopted from the shelter 12 years ago as a kitten. Do people think that it is the shelter's responsibility to find their pets a new home? It's not. Beneditte was terrified in the shelter and didn't want to be handled. As a result, she only had a few days for someone to rescue her. We found the perfect person for her to share her life with, and in the nick of time, Beneditte was saved. According to her surrender questionnaire, Beneditte loves playing with ribbons and sleeping. May she have many cat naps in the sun, and lots of time with ribbons in her future! Popsicle had a home. He even was registered/licensed with the shelter, but despite repeated attempts to reach his owners, no one claimed him. 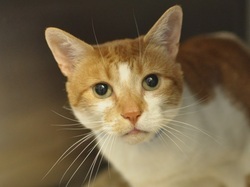 This orange and white tabby was as friendly as can be, and needed to be rescued due to a broken tooth. With the power of networking, a wonderful couple came to Popsicle's rescue! Reminder: Always keep your pet's microchip information updated. It could save their life! 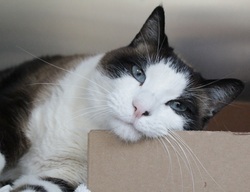 This gorgeous Snowshoe cat found himself at the San Jose Shelter after the July 4th holiday, the worst day of the year for pets. This cat, referred to as "unknown" was estimated to be about 10 years old, had a minor fox tail injury and a minor heart murmur all of which prevented him from being put up for adoption. Fortunately through our network we were able to locate a perfect foster to adopt home and save this poster boy 2 days before being euthanized. Today, "Bodie" is happy living in Santa Cruz with his new person. As a result of networking, Precious found a compassionate woman with 3 other senior pets who fell in love with her just in the nick of time. 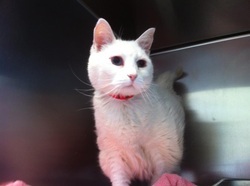 Precious currently lives in a large home on 3 acres and has already forgotten her time in the shelter. Luna's cards were stacked against her. She was 15, she was overweight and she had a heart murmur. On the other hand, this blue eyed beauty was gentle and sweet, and loved cheek rubs. Despite all of the odds, we set our network in motion and a lovely person stepped forward to become Luna's hero. What appeared to be strikes against Luna were in reality aspects of her that were unique. Her new owner prefers senior kitties, and found a special one with Luna. We wish you the best pretty girl! At 15 years old, the chances are unfortunately slim to make it out of any shelter alive. They may be the general rule, but in the case of Bosco, he is truly the exception. Abandoned by his owners upon moving, Bosco appealed to the kindness of strangers in the neighborhood and fended for himself for a long time. Due to our network, his story touched many compassionate people who believe that even seniors deserve a second chance. 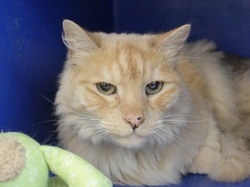 Bosco won the lottery in his new owner who swooped in at the last moment to take Bosco in. Bosco now lives happily ever after indoors in San Francisco with a bunch of dogs. He enjoys being fed on a regular basis and wears his identification collar with pride. For more information about Bosco, see our blog post. 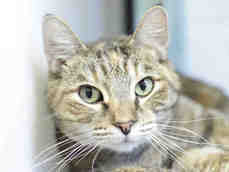 Peanut is a 7 year old tabby who had spent the better part of the summer at the shelter patiently waiting for a new home. It wasn't her fault that she ended up in the shelter smack in the middle of kitten season. It seemed like no one saw how her maturity was an asset. 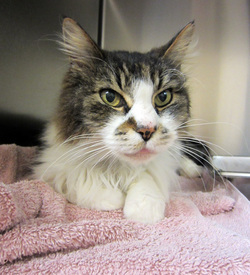 Peanut was sweet, affectionate, calm and really just wanted to hang out with someone. She was a zen type of girl. She was also an optimist and these great attributes finally paid off for her. Someone came in looking for Peanut, and it was love at first sight! This middle-aged kitty has a nice comfortable life to look forward to, and much love to give.